US$ 2375 / person ? 1 Arrival to Paro Arrival to Paro. Visit busy little town. Other sightseeing subject to time of arrival. 2 Paro Visit of the National Museum and Paro dzong (Rinpung dzong), the castle-monastery where Bernardo Bertolucci’s Little Buddha film was shot. The pristine Kyichu lhakhang is one of the two oldest temples built in Bhutan. Climb to Taktsang gomba (Tiger’s Nest), is the highlight of the tour. While the hike seems to be hard, it’s very rewarding. If you don’t feel so strong, you can climb just halfway to cafeteria with nice view of the place. You can consider hiking in the morning or early afternoon depending on weather, your fitness and preferences. 3 Paro – Jakar (flight) Taking domestic flight to Bumthang is extraordinary experience. You will see many of the seven and six thousand meters high mountains on the border with Tibet, including Gangkhar Puensum which counts as the highest mountain never summited by men. After landing visit to Jambay lhakhang temple, which pins down the leg of giant demoness. Continue walk to Kurjey lhakhang temple complex. Evening explore lively Jakar town. 4 Jakar – Ura In the morning we will start drive in direction to Ura village. We will stop at the place called Membartsho, the Burning lake. Here 5th century blacksmith-saint Pema Lingpa discovered cache of scriptures left here by famous magician-saint Guru Rimpoche. You can also visit to nunnery and see the life of Buddhist lady monks. Taking nice nature walk from there to intricate Zangopelri lhakhang temple is also interesting option. Continue drive to Shertong-la pass. In clear weather, there are chances to see highest mountain of Bhutan, Gangkhar Puensum, just before the pass. From the pass summit (3550m) it’s nice 45 minutes nature stroll down to Ura village. Here you can visit local monastery and village. Ura is already on the edge of Thrumshing-la National Park. During the rest of the afternoon you might try your luck by going in the forest and trying to spot animals. 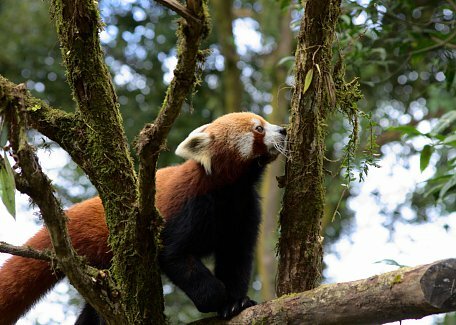 Red Pandas are present in the areas as well as clouded leopards and other wild animals. Anyhow please mind it's very rare to spot these animals and it very much depends on your luck. 5 Ura In the early morning we will start hike to Gayzamchu. This 5-6 hours hike leading over the ridge above the Ura village inside the Thrumshing-la National Park will give us some chances to spot wild animals, especially Red Panda. After reaching Gayzamchu area we will drive to Thrumshing-la pass, which is second highest motorable pass in Bhutan. Nice view are possible from here. Also we will stop at the Rhododendron park, just before the pass where the tens of different rhododendron species, growing in the area are on display. There are hundreds of different rhododendrons in Bhutan. We will stop on various places around the road in order to find good place to see wild animals which are plentiful in the dense alpine jungles around. Evening back to Ura. 6 Ura – Tingtibi We will take new road from Ura to Chummey. Shortly after leaving Ura and crossing the saddle, there is another place from where Gangkhar Punesum (7540m), highest mountain of Bhutan, which was never summited by man, can be seen. Continue to Chummey village and ascend to Yotong la pass (3500m). From here there is long descend to Trongsa with many curves and changing vegetation. Continue drive south. We will be descending through Mangdechu river valley where the cascade of hydro’s are being built. Jigme Singye Wangchuck National park is on the right side. After reaching landslide areas of Riotaula, the popular birdwatching area begin. You can peek for rufous necked hornbills in this area. Also the golden lagurs are living here. Drive through Zhemgang town and finish drive in the Tingtibi village, which is important junction of the area. 7 Tingtibi – Manas Today we will wake up before dusk and drive above the Tingtibi for bird and wildlife watching. Dense jungles are full of golden langurs and various birds including hornbills. This is one of the major birdwatching hotspots in Bhutan. Then we will get back to hotel for breakfast and will continue drive south to Manas. Before this was trekking trail but now comfortable paved road is built here. We will pass along beautiful waterfalls and nice views of river confluences. Finally we will arrive to the edge of the lowland, where the mighty Himalayas rapidly rises from Indian plateau. While reaching Manas, we will take ferry to other side of Manas river where the park headquarters is located. Manas National Park is habitat of many different animals, including Assam roofed turtle, hispid hare, golden langur, pygmy hog, wild elephant one horned rhino, tiger, wild water buffalo and others. Anyhow be humble in your expectations. Only the small portion of park is accessible and it's depends on good luck if you see any animal. Safari on elephant back is done in the afternoon. Elephants will take you uphill to scenic view point from where you can see the Indian plateau and Manas river meanders. After the safari, you will drive to Pangbang village and to for luxurious camping in Pangbang Jungle Camp. Evening experience of bonfire and local Kheng dance and song performance. 8 Manas – Trongsa This morning we will have another great adventure on river rafting safari with experienced local river guides. Rafting is relatively easy, although more thrilling rapids can be included. Apart from splashes, you might have a chance to spot some wildlife in the river or on it's shores. After the rafting, we will drive back to Tingtibi, Zhemgang and further to Trongsa, reaching there in the evening. Watch the roadside carefully while, sometimes you can spot a lot of wild animals just like that. 9 Trongsa – Phobjika Visit the great Trongsa dzong, the castle from which the royal dynasty of Bhutan has risen. Intricate museum in watchtower Ta Dzong hosts number of interesting artifacts related to royal dynasty, history of Bhutan and many religious statues and temples. After that drive to Wangdue with the stop at Chendebji chorten, which was modeled after Boudhanath stupa in Kathmandu. Continue drive to Pele-la (3540m) pass, which is divide between central and western Bhutan. This is habitat of gray langurs which can be spotted at the place from time to time. Reach to Phobjika valley. Optionally you can attend lesson on Buddhism led by accomplished master with translation to English in Gangtey monastery shedra (buddhist college). You might also like to spend overnight in local farmhouse as a host of welcoming family or even try the hot stone bath, traditional Bhutanese treat. 10 Phobjika – Wangdue Visit of historical Gangtey gompa. 2½ hour walking tour through the valley is one of the most beautiful and easy hikes in Bhutan. You will go through the buckwheat and potato fields to the mixed forest with trees decorated with old men's beard lichen and finally you will get a view of marshland. Here, in late autumn and winter, rare black neck crane can be seen. Birds usually stays from November to February. We will definitely visit black neck crane centre with interesting exposition about these elusive birds which are considered holy by the locals. Afternoon drive to Wangdue. You might like to visit rustic Rinchengang village to experience life in rural Bhutanese settlement. 11 Wangdue – Thimphu Short morning hike to Khamsum Yulley Namgyal Chorten with wonderful view of the valley and it‘s terraced paddy fields. See the longest suspension bridge in Bhutan stretching the length of 350m over Pho Chhu river. Visit of Punakha dzong, which counts as the most intricately decorated castle in the kingdom. Short walk to Chhimmy lhakhang temple, devoted to 15th century saint Drukpa Kunley, know as “Divine madman”, who did taught Buddhism by singing, drinking and rampant sexual behavior. If time permits, also visit Sangchhen Dorji Lhuendrup Lhakhang nunnery with Bhutanese and Nepali style stupa, overlooking the valley from the high hill. Afternoon drive to Thimphu. Visit of Tashicho dzong, the castle, which serves as seat of the king and government. 12 Thimphu Early morning drive to Buddha Dordenma, the gigantic statue of Buddha overlooking the valley and walk to striking city viewpoint. Walk in Norzin lam street and see the traffic police signaling in junctions. Thimphu is only capital in the world without the traffic lights. Finish walk at handicraft market where many interesting Bhutanese souvenirs can be seen and bought for reasonable price. Excursion to Taking reserve. Here the animals are kept in safe and bred to be released to wild nature from time to time. Usually you can also see muntjak (barking deer) and himalyan spoted deer here. These animals are kept here after being found injured in the wild for recovery. Visit hand paper factory a Thangkha painting centre, where young artists learns the skills of their forefathers. After that drive to Changankha lhakhang, the oldest place of worship in the valley. Visit of Tashicho dzong, the castle, which serves as seat of the king and government.